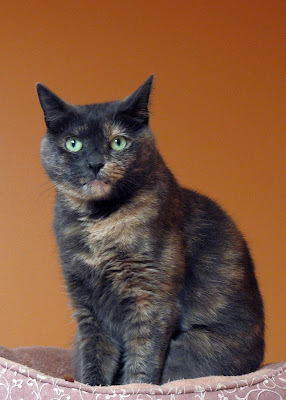 helping show off the newly painted walls in PAWS' Cat Room One. 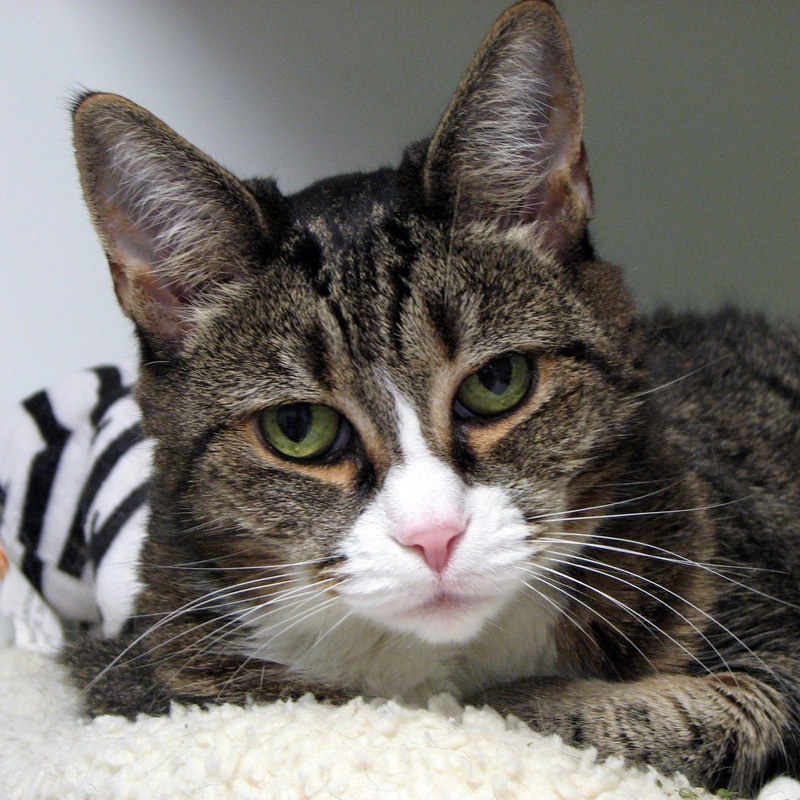 This sweet and adoptable ladycat is about 6 years old, friendly, and good with other gentle kitties. She is spayed, microchipped, current on all of her vaccinations, and has tested negative for FeLV and FIV. You don't need any milk with this Oreo! Check out these special moments captured between Tracey and our super sweet (and adoptable) friend, Oreo, in the PAWS meeting room. PLEASE take a minute every day to help the PAWS animals! 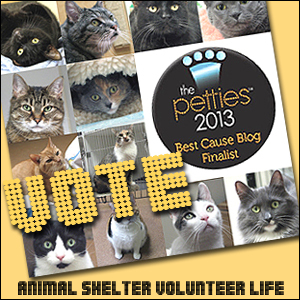 We're a finalist in the "Best Cause Blog" category of the 2013 Petties! 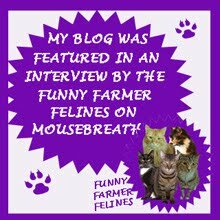 PLEASE VOTE DAILY for us (and your other favorite pet blogs) now through July 31 (and invite anyone and everyone you know to do the same). 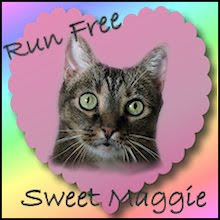 Especially since PAWS will win $1000 (which will go a long way in helping the cats and dogs who are there)! 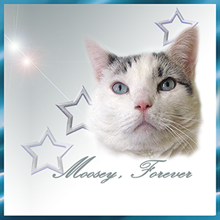 You can VOTE HERE (or click the Petties link in our sidebar). Thank you! 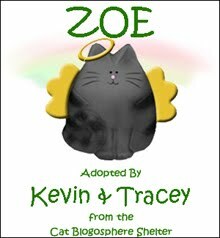 Have you heard the mind-boggling statistic about black cats being only half as likely to be adopted than cats of other colors? 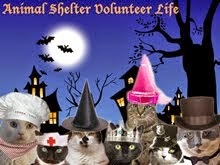 And that on average, their stays in shelters are several months longer than those of other cats? We've certainly seen this time and again at PAWS with cats like super sweet Allie, who had been here since October of 2010. 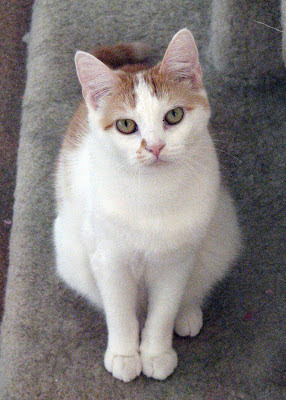 Allie had come very close to being adopted a few times, but until recently was still waiting and hoping for her very own happily-ever after. Well, guess what? Her new mommy (PAWS volunteer Laura) says: "Allie is doing well. She is a sweetie pie. We are so happy we got her! and so happy we are able to give her a loving home. 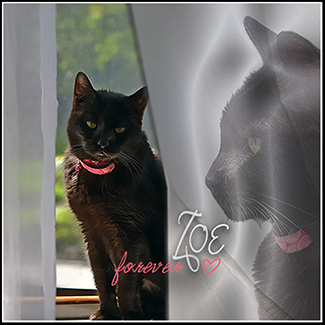 She was introduced to the upstairs, next it will be our other 2 black kitties we have." Much love to you and your forever family, Allie. We are over the moon for you all! Big congratulations are also in order for Crazy Horse, Gus, Oliver (from foster), and Peanut, who were also adopted! Hooray! 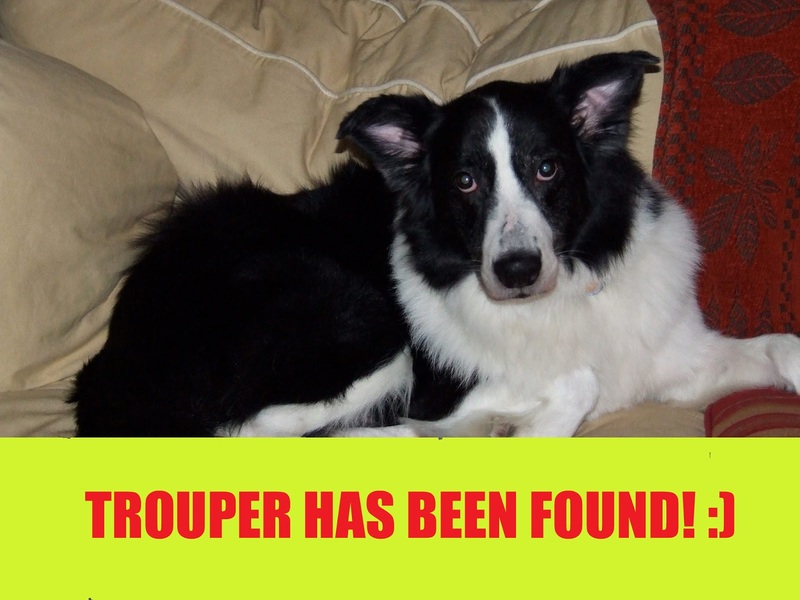 Trouper Has Been Found! He's pretty dehydrated, as we are in the midst of a severe heat wave, so Cindy is on her way to the vet with him now. 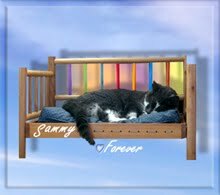 Please keep those purrs, prayers and good thoughts coming, as Trouper and Cindy can still certainly use them. To all who helped with the effort to find him -- searching, posting, sharing, purring and praying, sending positive energy, and everything else -- THANK YOU. You're great, and we all appreciate you so much. 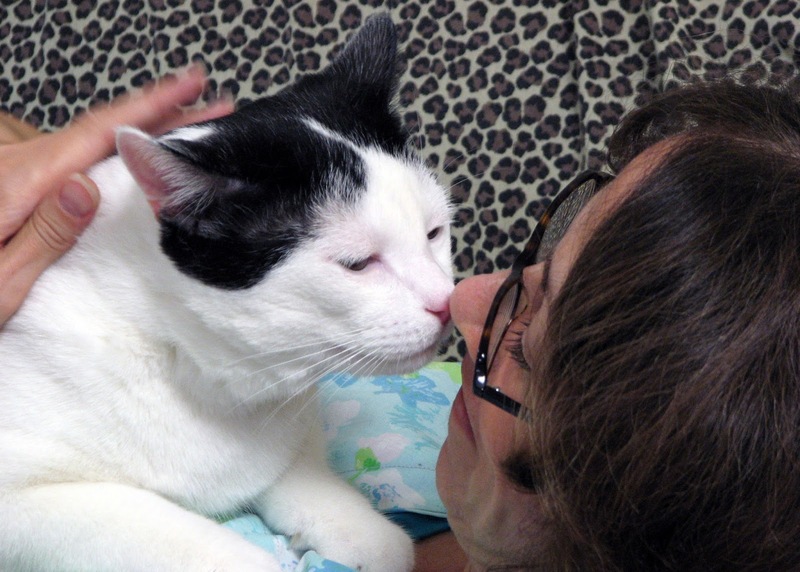 In all of our time volunteering at PAWS, we've made many wonderful friends. 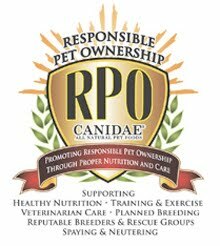 One of them, dog volunteer extraordinaire Cindy, needs our HELP! Her dog, Trouper, is MISSING. 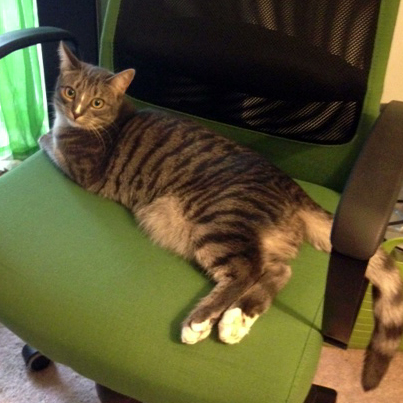 He disappeared today (July 18th, 2013) at about 11 AM, in the vicinity of East Rocks Road in Norwalk, Connecticut. 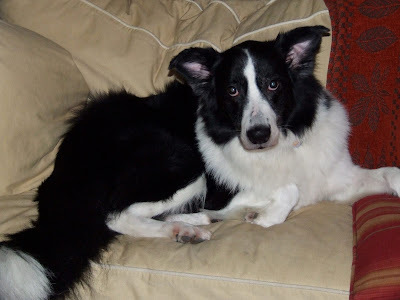 Trouper is a black and white Border Collie, 15 years old. He has a collar and tags, but you probably won't see them, since he's very furry. He has a very long tail, which sometimes curls over his back. 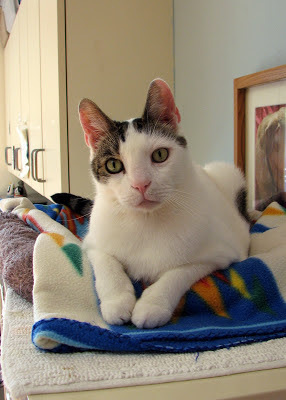 If you spot Trouper, please call Cindy at 203-988-3769. PLEASE SHARE. You just never know who might know someone who can help find Trouper. 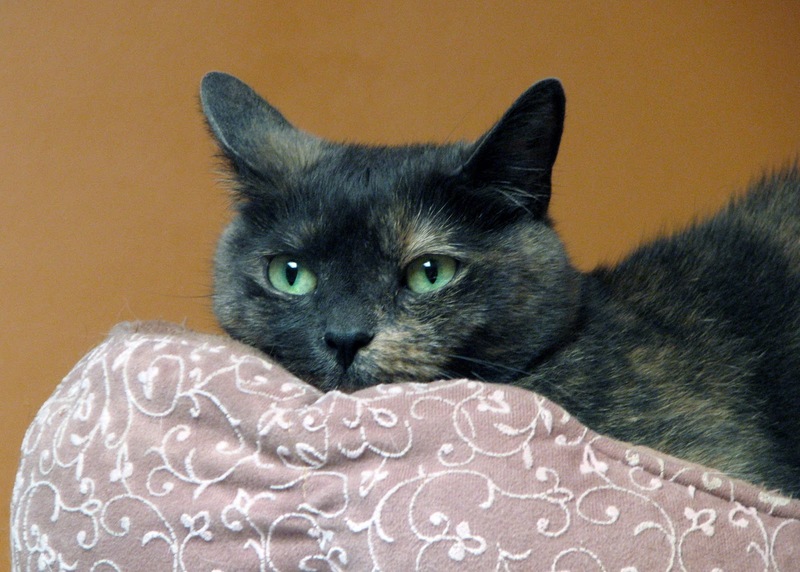 Remember our sweet friend Sheba? 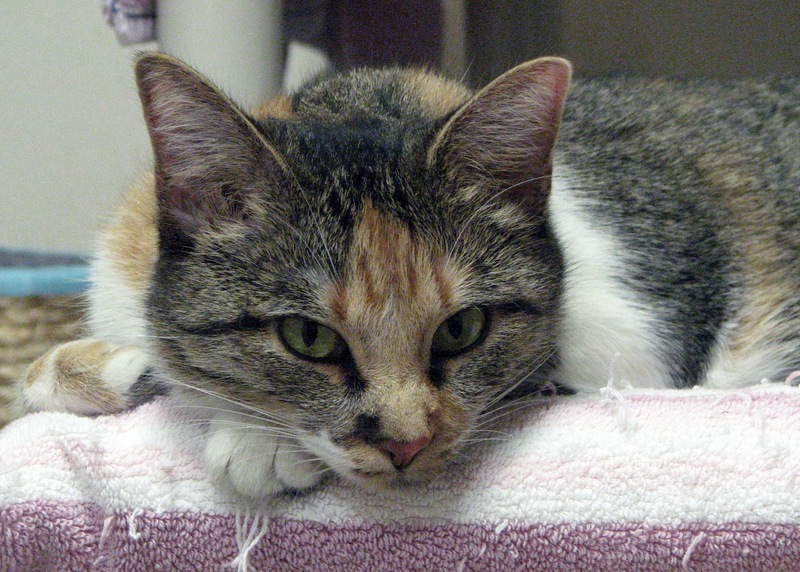 Much to our delight, this beautiful and adoptable girl continues to open her heart to us. 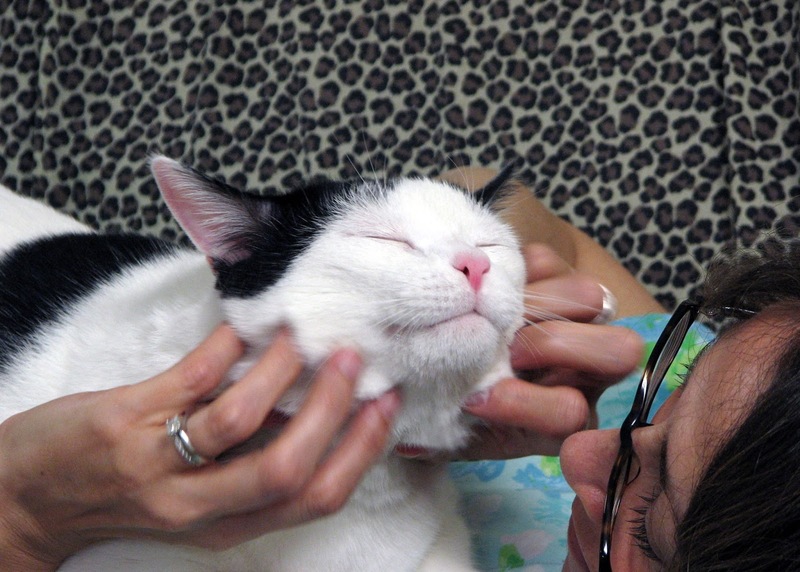 She loves being pet, and spending time with her favorite volunteer pals. We all love spending time with her, too. Archie and Tug met just recently in Cat Room 5. As you can see, they've quickly become best pals. Here's the full list of recent graduates. We love you, kitties! ConCATulations to you and your new families! 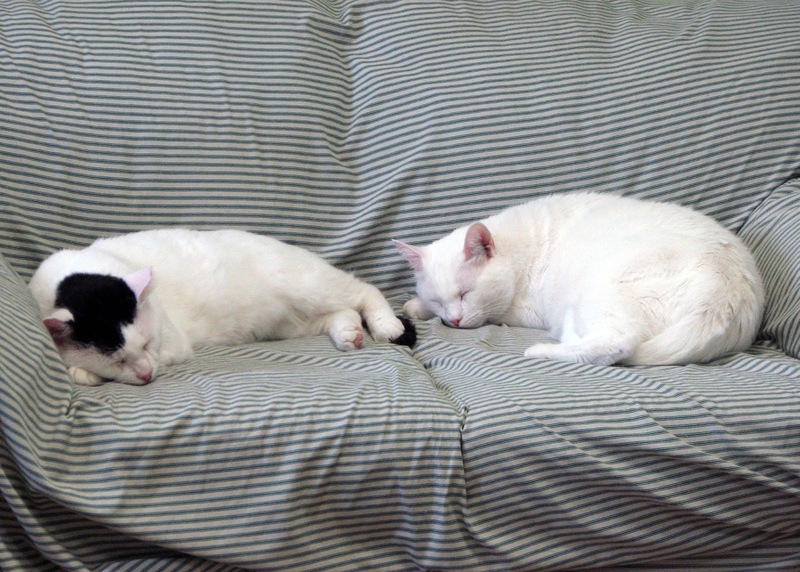 Rounding things out, check out these pictures of two of our PAWS alumni living the high life in their very own homes. 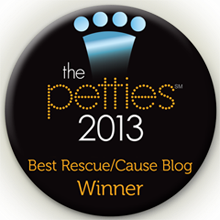 As we shared over the weekend, we're a finalist in the "Best Rescue/Cause Blog" category of the 2013 Petties. 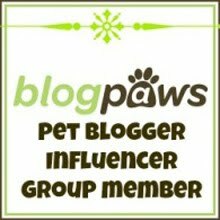 We also mentioned that we are thrilled to be in the company of so many blogging friends, including our wonderful pals at Pet Blogs United, who are finalists in the "Best Overall Pet Blog" category. 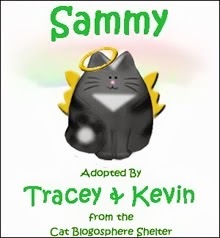 In an amazingly kind and generous gesture, Pam and Oskar have pledged that if they win THEIR category, they'll donate the prize money to PAWS. How cool is that?! Thank you, Pam and Oskar. You rock! You can VOTE HERE (or click the Petties link in our sidebar). Thank you! Hi everybody, I'm Max. 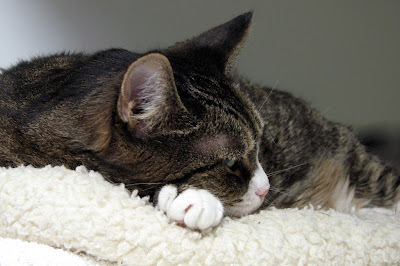 I've been here at PAWS for a while now, and I have to say that it's a pretty good place. 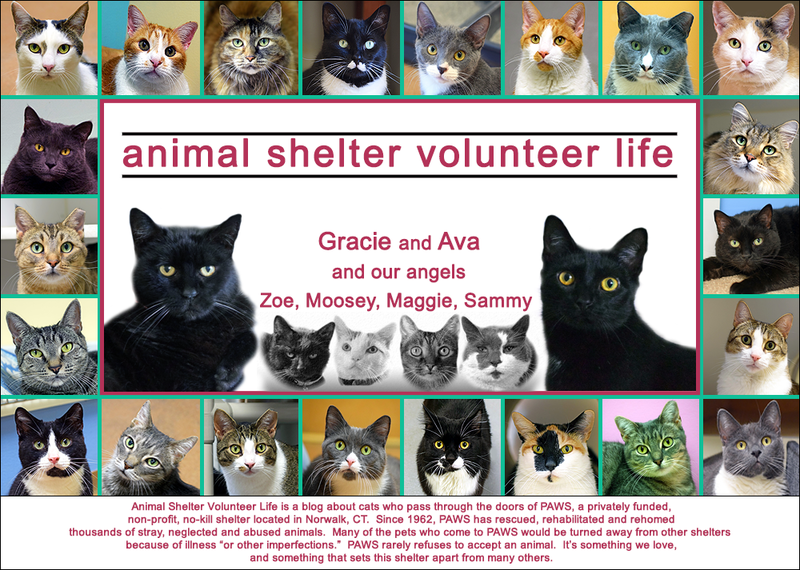 The volunteers and staff give me lots of love and attention, and my roommates Gracie, Zoe and Freddy are pretty nice cats. Our room has a window we all like to look out of, and the sunpuddles are fantastic. We have a sink, too, which is great, because I like drinking from the faucet! But like all the kitties here, I'm wishing real hard for a forever home. I had one once, but I ended up at PAWS after my people developed allergies. I'm sweet, outgoing, good with other cats, and even like dogs! 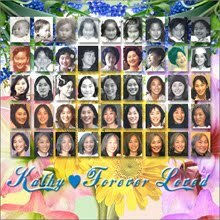 I'm about 11 years old, but I have lots more years of loving and living left. 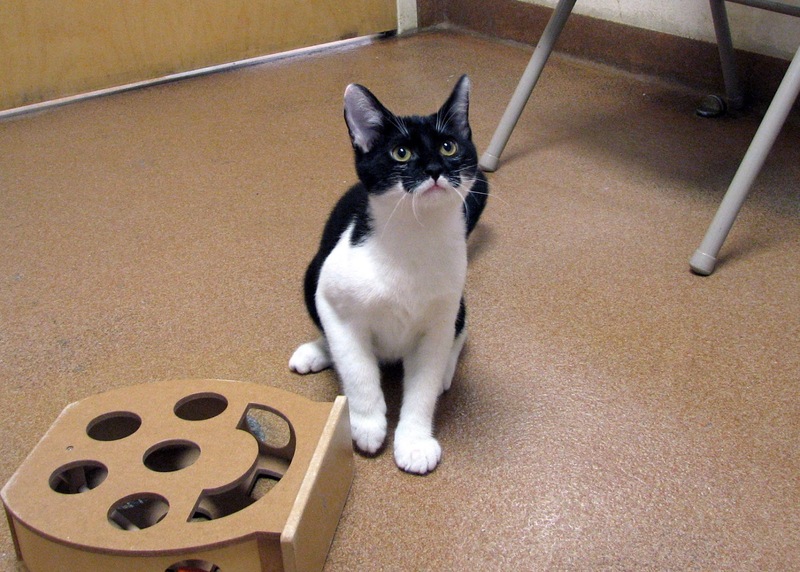 I'm neutered, up to date on all my vaccinations, and micro-chipped. 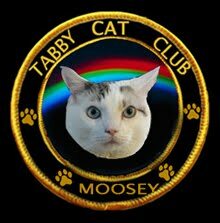 And I've tested negative for FeLV and FIV. So, what do you say? Come meet your new best friend (ME!) at PAWS today! 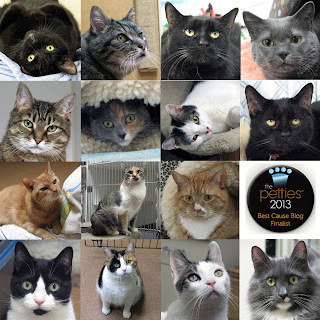 Finalists for the 2013 Petties Awards! 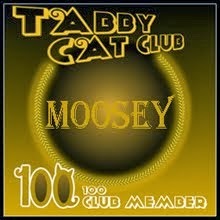 Holy Cat! 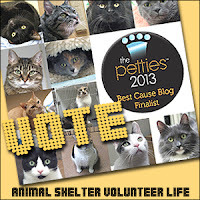 We just learned that Animal Shelter Volunteer Life is one of the four finalists for the "Best Cause Related Blog" category of the 2013 Petties Awards! 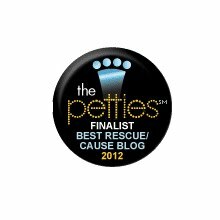 This is the second year in a row we have been a finalist for the Petties, which are DogTime Media's annual awards show recognizing "the best of the pet blogging community." Huge thanks to everyone who nominated us (including our awesome pals at Rumpydog, who actively encouraged their readers to nominate us). What an incredible honor to be included among so many amazing bloggers we respect and admire. Good luck to all of the finalists (many of whom are our friends)! 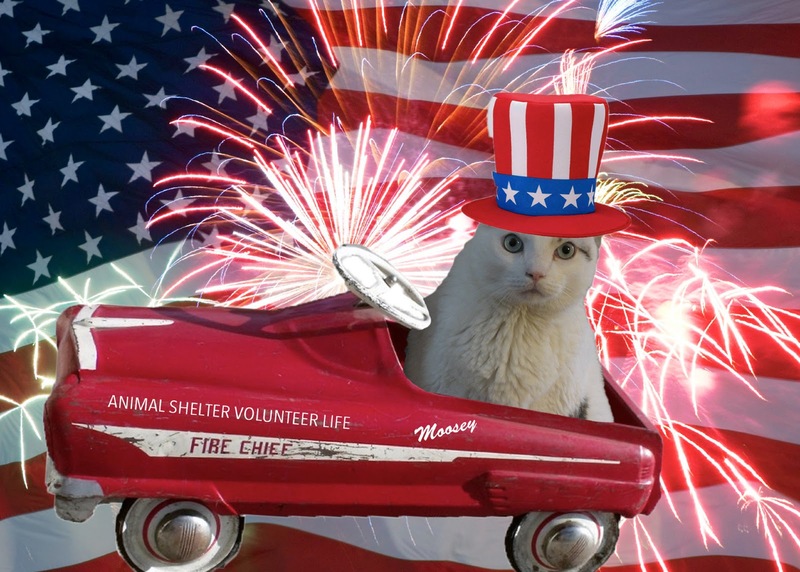 No matter who wins, we're glad that the animals will benefit! How, you ask? 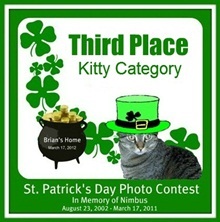 Well, the winning blog in each category will receive a $1,000 donation to the shelter of their choice. 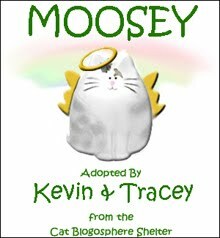 We, of course, would choose PAWS of Norwalk, Connecticut, where we volunteer, and where Moosey, and Angels Sammy, Graphite, and Lady Madonna were adopted from. And in case you're wondering ... all of the beautiful kitties in the collage above are just a few of those now at PAWS, waiting to find their very own forever homes. and all of us here at Animal Shelter Volunteer Life! Merritt is beautiful and fun. This gorgeous torbie LOVES to play, and gets along with some other cats. She'd do best in a home without small children or dogs, and where her people understand that sometimes even the most loving cat needs her space. 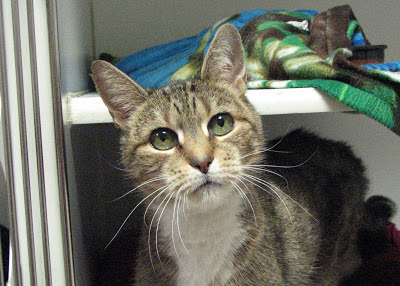 Sweet, soulful Sandy came to PAWS when her owner had to enter a nursing home. 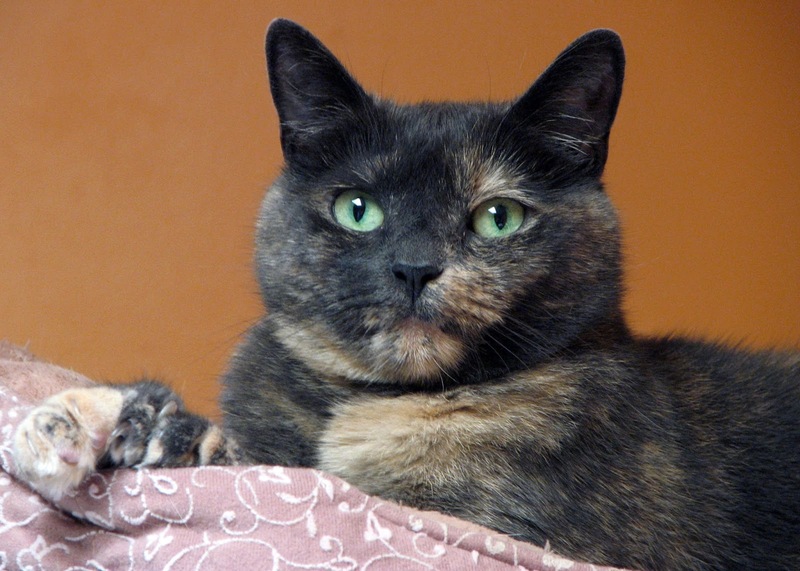 This extremely affectionate lapcat has energy (you should see her jumping skills!) that makes it hard to believe she's 16 years old. 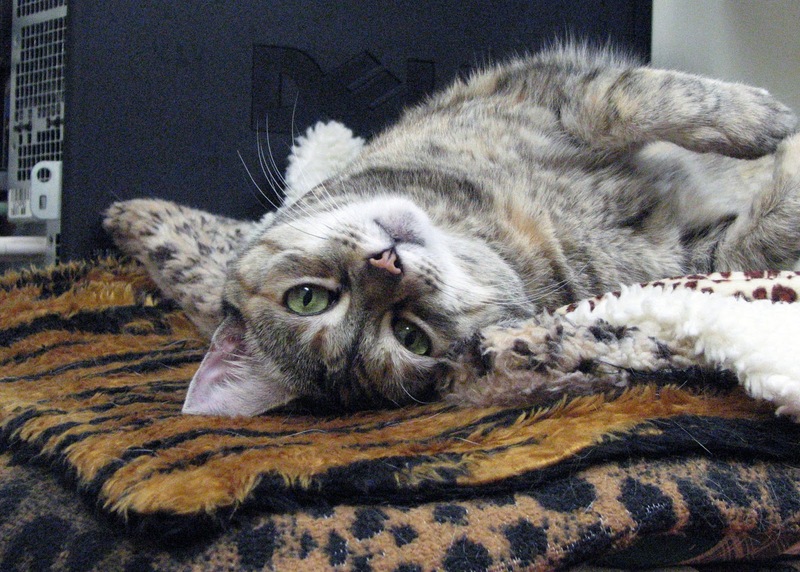 Sandy loves playing, snuggling, and being brushed. 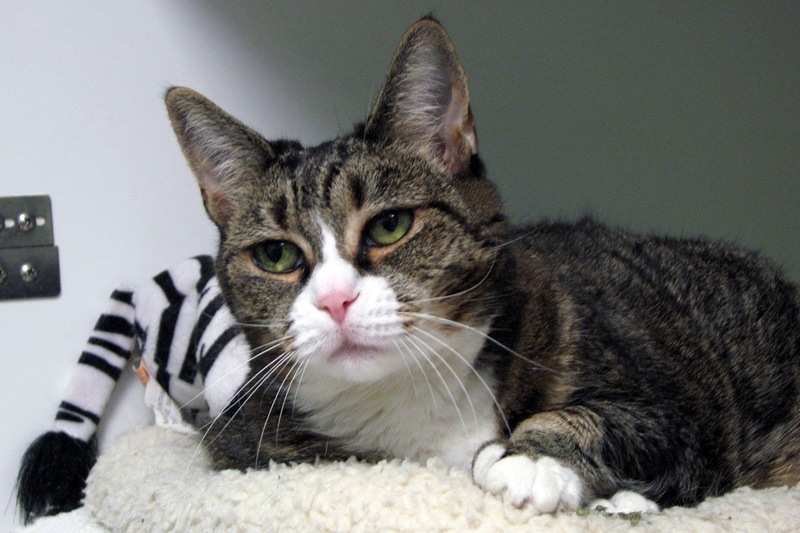 She is eligible for PAWS' "Seniors for Seniors" program, and also a lower adoption fee for seniors. Truffle may not be a lapcat, but that doesn't mean she's not affectionate. She loves weaving in and out of the PAWS staff and volunteers' legs, and being pet on the head and behind her ears. This 7 1/2 year-old loves relaxing in sunpuddles (who doesn't? 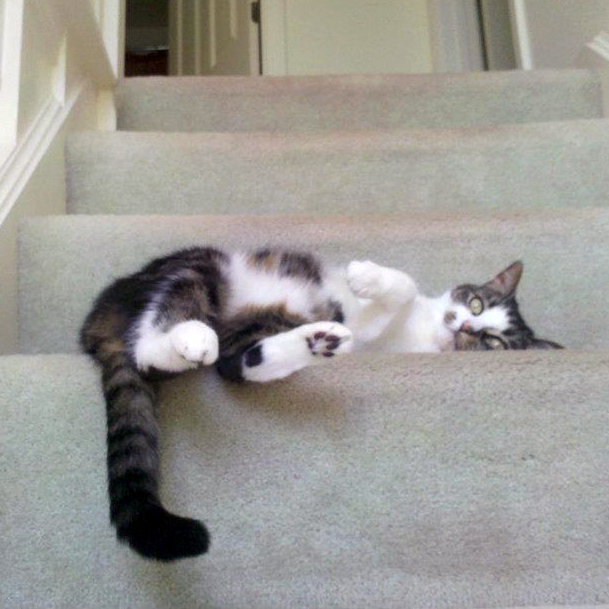 ), and is very playful, too. You can read more about Truffle here. 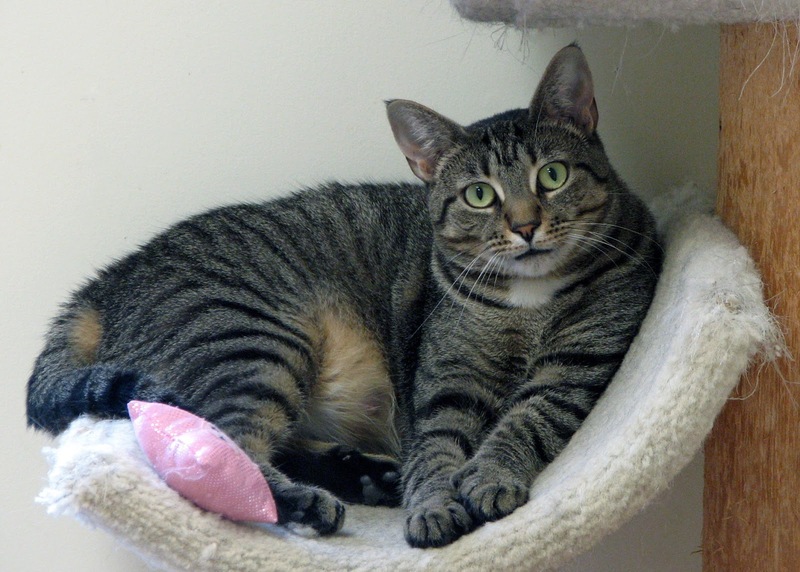 All three of these terrific tabby girls are available for adoption at PAWS. 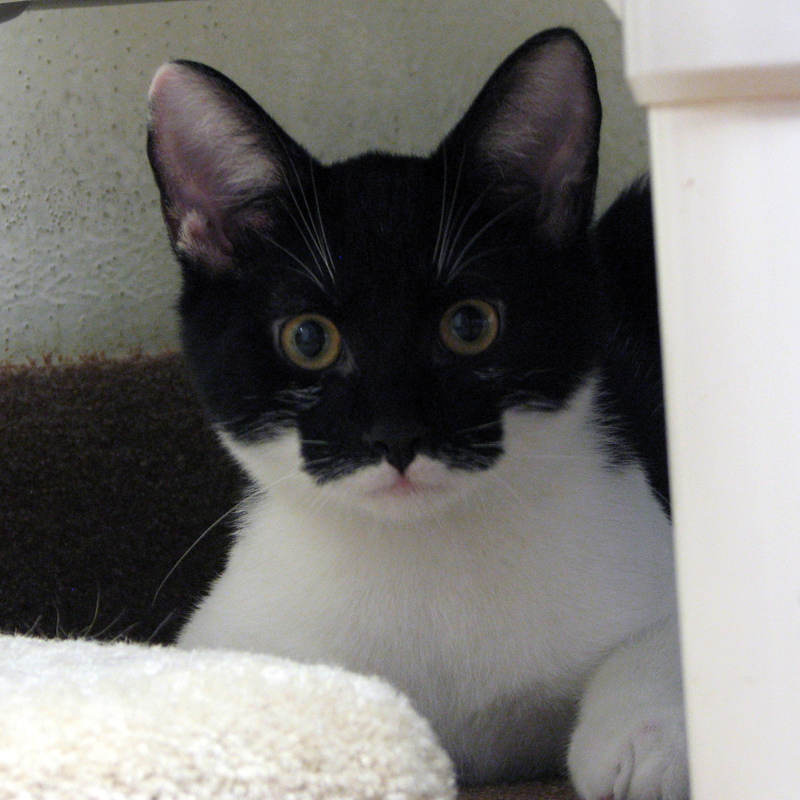 They are spayed, micro-chipped, current on all their vaccinations, and have tested negative for FeLV and FIV.